Illuminate the underwater world at depths as great as 328' with Bigblue's AL1200WP Wide-Beam LED Dive Light. Its XML white LED outputs 120-1200 lumens in four selectable levels. Power is provided by a rechargeable 18650 lithium-ion battery, which gives the light a runtime of 2-20 hours, depending on the brightness level. 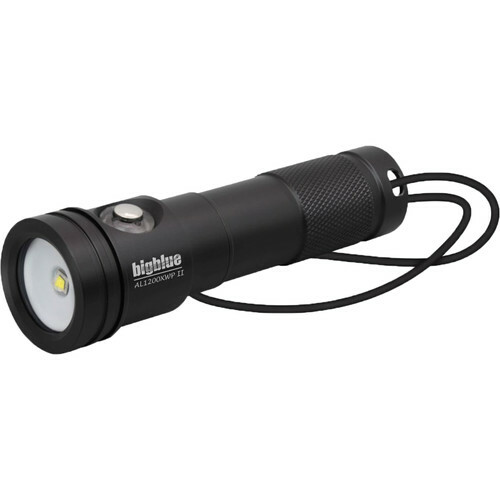 The AL1200WP's wide 120° beam is great for use as a primary, all-around dive light. A daylight-balanced 6500K color temperature helps restore hues that get absorbed by water, so you can bring color accuracy and richness back to your images. Built for durability, especially resistance to corrosion, the housing is made of anodized aluminum. The light is controlled by a side-mounted push-button switch.